January 7, 2015 By This post may contain affiliate links. This winter, get crafty in the kitchen by making some sweet and salty snowmen pretzels. 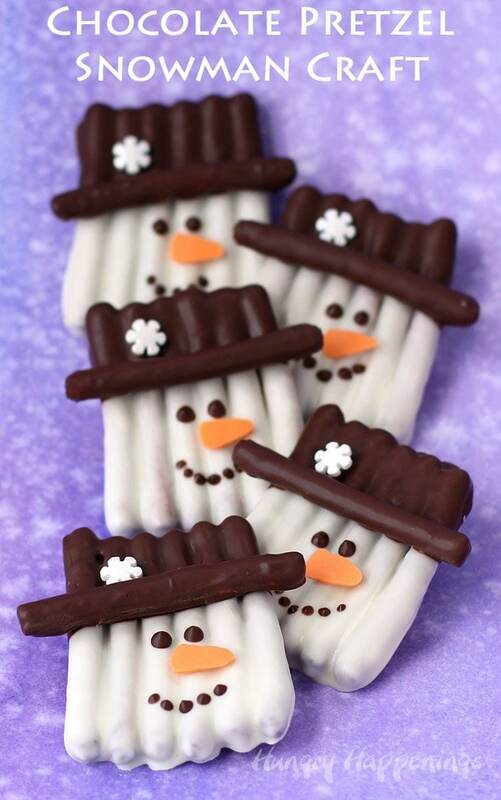 Each Chocolate Pretzel Snowman Craft couldn’t be cuter with their orange carrot noses and snowflake topped hats. They make perfect Christmas treats and wintertime snacks. A simple winter time craft inspired me to make these Chocolate Pretzel Snowmen. 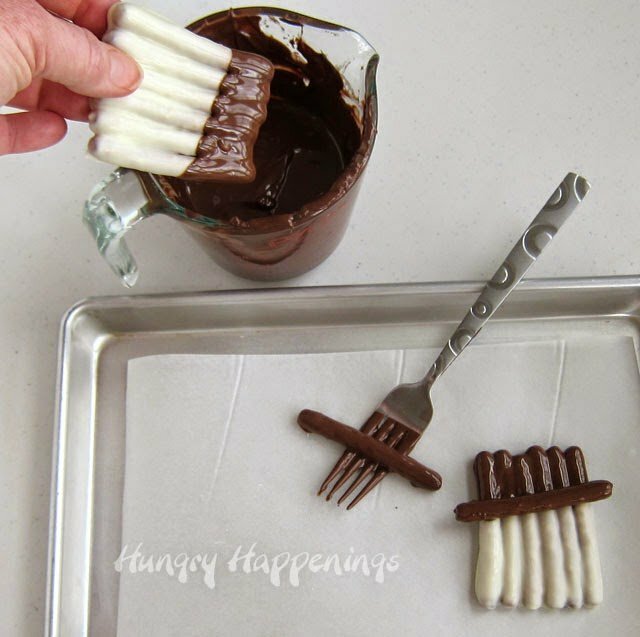 Instead of using popsicle sticks that have been painted and glued together to create my craft, I used chocolate dipped pretzels for a cute and tasty treat. I’m not sure who made the very first popsicle stick snowman, but I’m pretty positive it was many years before the internet was popular. I have a vague recollection of seeing kits to make this craft back in the 80’s in Oriental Trading catalogs. 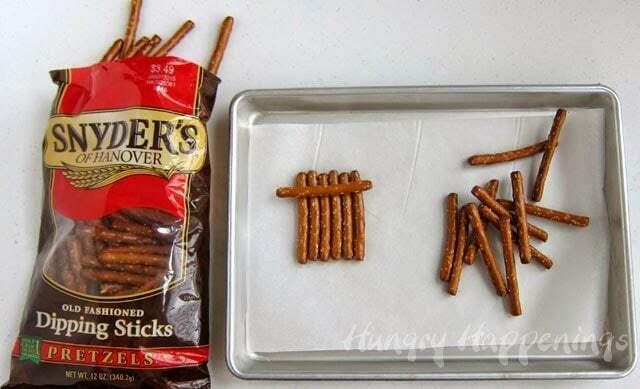 I always thought they’d make a fun edible craft, but knew that using pretzel rods would make a much larger treat than most people would want to eat and using pretzel sticks would be too small. The Dipping Pretzels unfortunately are not available at all grocery stores. I happened upon them while shopping at Kroger and also found them at Walmart. So, if you find them in your store, be sure to pick up a bag or two, so you can make these snowmen, or one of the many other designs I’ll be sharing with you soon. You can get them from Amazon, but you have to buy 12 bags. That’s a lot of snowmen treats, but perhaps you need a lot or you’ll share the bags with some friends. I only made a few, just enough to share with some friends on a cold and blustery winter’s day. 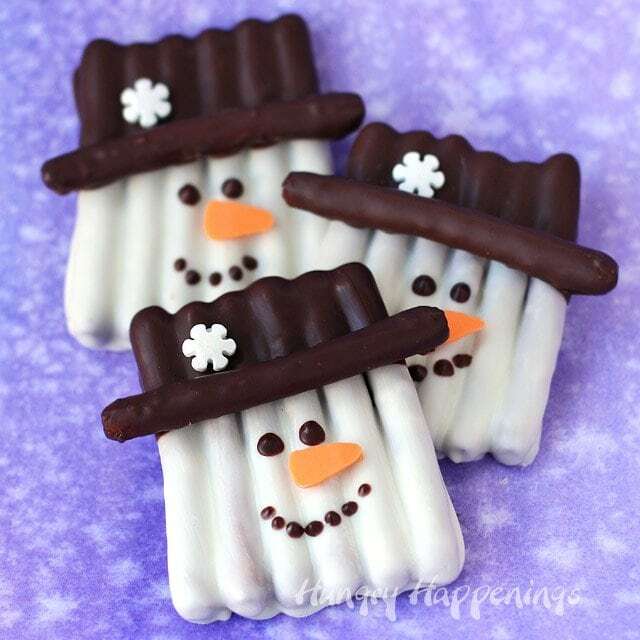 Turn pretzels into cute white chocolate snowmen. Pipe small triangle shaped orange carrot noses onto a parchment paper lined baking sheet. Remove from freezer and peel them off the paper. Dip one pretzel into white chocolate, leaving the top edge un-coated. Set on a parchment paper lined baking sheet. Dip 5 more pretzels, setting them next to each other on the pan. Freeze for 3-5 minutes until the chocolate sets. Dip the un-coated part of the pretzels in dark chocolate. Dip one whole pretzel in dark chocolate and set it across the snowman creating the brim of the hat. Freeze for a few minutes until hardened. Attach one orange carrot nose to the snowman's face and a white snowflake on each hat. Paint or pipe dark chocolate dots for the eyes and mouth. 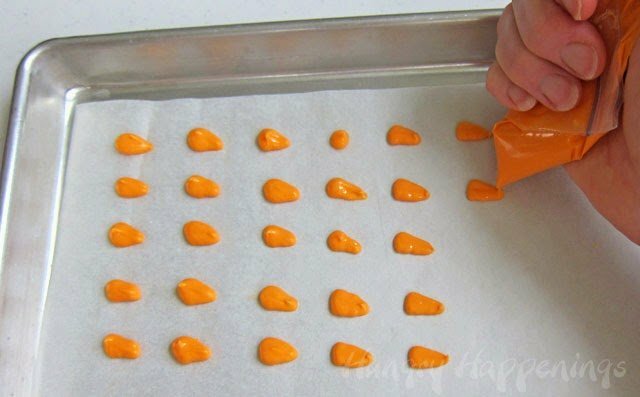 Pour melted orange candy melts into a small zip top bag, and snip off one tip. Pipe small triangle shaped orange carrot noses onto a parchment paper lined baking sheet. Each nose should be about 3/4 inch long. Pop tray in freezer for about 2 minutes, until the candy noses are set. When you open your bag of Dipping Sticks. you will find various pretzel lengths. I found it best to put 6 pretzels of similar size together for the snowman head, then find one that was longer for the brim of the hat. 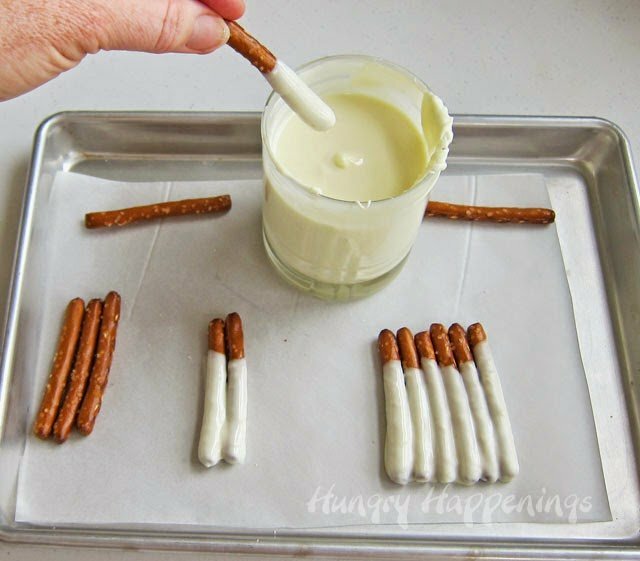 Dip each of the 6 pretzel sticks into the white chocolate, remove from the chocolate and allow excess to drip back into the bowl then set them next to each other on a parchment paper lined baking sheet. Pop in the refrigerator if using pure white chocolate and the freezer if using confectionery coating for 3-5 minutes until the chocolate sets. Allow the pretzels to warm up to room temperature, then dip the un-coated ends into dark chocolate. Dip one pretzel completely in the dark chocolate, allow excess to drip off and let it sit a minute to begin hardening. 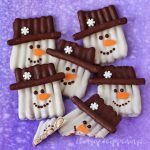 Place it at a slight angle just at the bottom edge of the dark chocolate dipped pretzels forming the brim of the snowman’s hat. 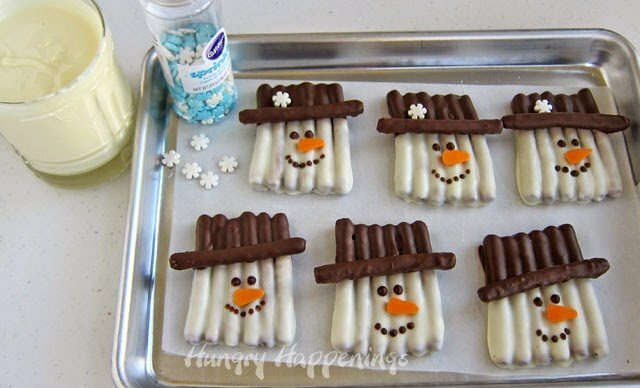 You can dip all your pretzel brims and allow them to harden before adding them to the snowmen, if you prefer. 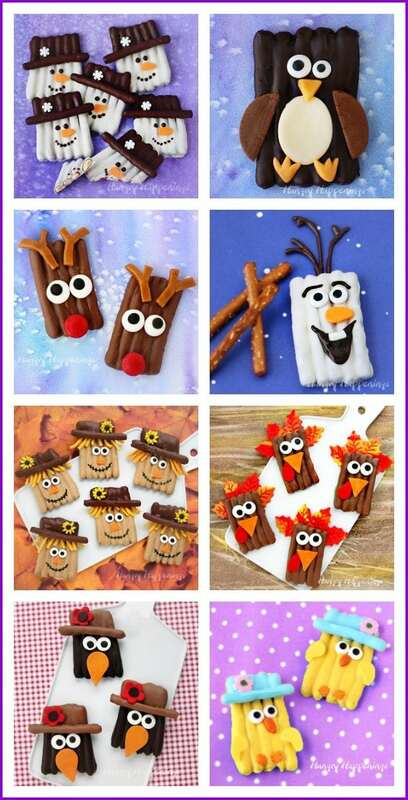 Use a food use only paint brush, to paint chocolate eyes and a mouth onto each snowman. Attach one orange carrot nose to each snowman using a dab of white chocolate. Chill for 2-3 minutes until hardened. Use a dab of white chocolate to attach a candy snowflake sprinkle to each hat. I used Wilton’s large white snowflake sprinkles to adorn my hats. You can use any decoration you like. Stars or flowers would be great too. If you want to get fancy, add a band just above the hat brim. Store in an airtight container for up to a month. Here’s a new video tutorial that shows you the entire process. 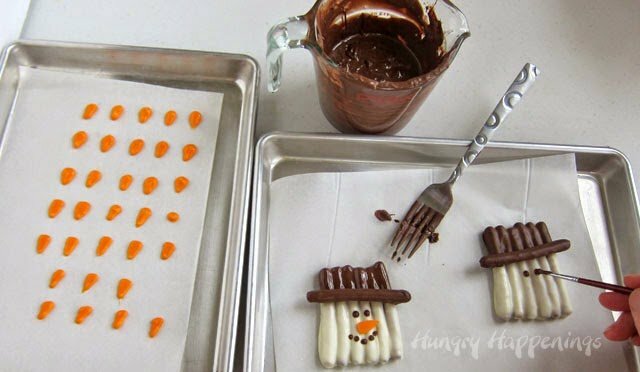 Have fun making your Chocolate Snowman Pretzels. Be sure to check out all my fun Christmas Recipes! 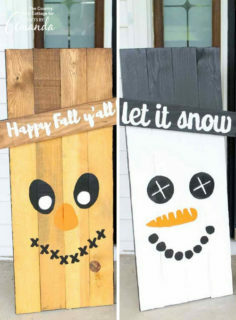 If you’d like to make a more permanent version of this project be sure to check out the tutorial for a Reversible Scarecrow Snowman Pallet Craft at Crafts by Amanda. wouldent a candy corn do in place of the carrot for the nose? Would you believe I actually have had my pretzels ready to go after seeing this in OT. You beat me to it and I LOVE the way your little snowmen pretzels turned out! Only you would have looked at wooden sticks painted white & thought of this. I have lots of ideas using these pretzels including a witch, so stay tuned for more throughout the year. love these beth! you are an idea machine! how do you get so much content out so fast!! happy new year! Thanks, Michelle. I have more ideas than I have time to create. If someone would take over all the other blogging stuff, I'd be able to post once a day! I'd love that. I'm in love with these adorable snowmen!! What an awesome canvas you created with these pretzels! Can't wait to see more. Thanks. I am so excited to turn this idea into other designs. I already posted another one. They would certainly warm year heart during the cold months! Just wanted to let you know that “Michaels Craft Store” sells the pretzel rods also. Is there any reason you couldn’t make these smaller with the little stick pretzels? They are adorable! These are adorable! I was planning on only making cookies to give as gifts for the holidays but your website has so many great candy ideas too! I’m definitely going to make these pretzel snowmen. Hi Beth. I made the snowmen today and they were really fun to make. I couldn’t find the dipping pretzels in the Walmart by my house, so I made them with regular pretzel sticks. For the nose I did an orange mini kiss instead of the carrot shape and I had to double dip the pretzels in the white chocolate, but they turned out almost like yours. I will make them again. Thank yoiu for your website. Very creative. Hi Loren, if you keep them in an airtight container at room temperature they will keep for about a month. I don’t recommend storing them in the refrigerator. Have fun. I hope your son’s classmates enjoy their treats. Went bananas when I found these delightful “doins” and want to get your printed book on making them but, for some reason, I can’t get it ordered. I see Amazon is involved but is there a way to order it by mail ? These are absolutely adorable. Easy to make. Can’t wait to try these!